THE Byron Bay Services Club Rams enjoyed a heartening return to form this week, thanks to the emergence of an exciting new generation of football talent. Backed by the skills and determination of Byron's veterans, youngsters Otis Adlington, Rick Muir, Jack Martin and Zac Miletic took full advantage of their opportunity to shine. 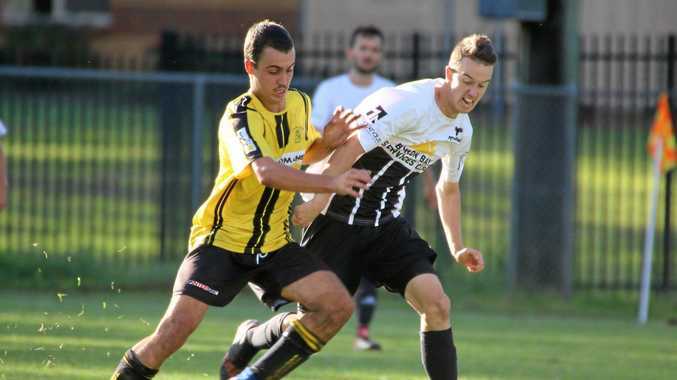 Wednesday night's Anzac Cup semi-final saw the lads put in an inspiring performance that helped drive the Rams to a 2-0 victory over rivals Richmond Rovers. Goals to Ethan Archer and Simon McCarthy secured a berth in the Anzac Cup final at Crosier Field in Lismore on Saturday, April 27, when they will meet the Bangalow Bluedogs. Kick-off is at 4pm. Sunday's away game at Goonellabah (round 3 of the general season) produced more outstanding performances from Byron's young recruits. The Reserves set the tone with a strong 3-2 win over Goonellabah before the young Premier Division hit the ground running. Three minutes into the opening stanza, 17 year-old Zac Miletic cut through the Goonellabah defence and curled a stunning strike inside the near post to give the Rams an early lead. Stung into a vigorous response, the Hornets fought back for the remainder of the first half and for much of the second but were unable to penetrate James Tomlinson's back line. With young legs showing little sign of tiring, Jonno Pierce came off the bench late in the match to reinvigorate the Byron attack. Jack Martin broke away from the Hornets defence and after solo sprint towards the Goonellabah goal, put away number 2 for the Rams. Finally, in the dying moments of the match, Pierce out-flanked the Goonellabah defence to deliver a superb cross from out wide as Martin and Miletic stormed into the box. A cool-headed move saw Martin step over the ball to allow Miletic a clean strike into the Hornets net, sealing a much needed 3-0 win for the Rams. The victory lifts the Rams from the bottom of the table and has them fired up for the next round in Alstonville on Wednesday, May 1. Reserves kick off at 6pm and the Prems at 8pm.